Donald Trump embarked on Monday on a whirlwind final push across three states to stop Democrats from breaking his Republicans’ stranglehold on the US Congress in midterm elections amounting to a battle for the soul of the turbulent country. 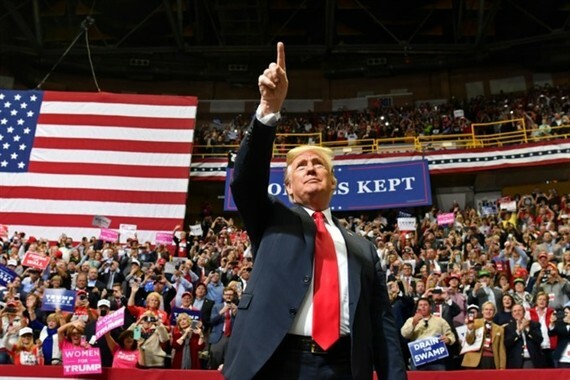 Cleveland, Ohio; Fort Wayne, Indiana; then Cape Girardeau, Missouri: it will be well after midnight before the real estate billionaire and populist showman gets back to the White House -- and only a few hours more before polls open on Tuesday across the world’s largest economy. "Everything we have created and achieved is at stake on election day," Trump told a cheering crowd in Cleveland, as he kicked off his furious last round of campaigning. "If the radical Democrats take power, they will take a wrecking ball to our economy and to our future." Trump is not on the ballot in the midterms, in which the entire House of Representatives and a third of the Senate are up for grabs. But in a hard-driving series of rallies around the country the most polarising US president for decades has put himself at the centre of every issue. With a characteristic mix of folksiness, bombast and sometimes cruel humour, he says voters must choose between his stewardship of a booming economy and what he claims would be the Democrats’ extreme-left policies. The bid to make it all about Trump is a gamble, as is his growing shift from touting economic successes to bitter -- critics say racist -- claims that the country is under attack from illegal immigration. In the run-up to Tuesday’s vote Trump has sent thousands of soldiers to the Mexican border, suggested that illegal immigrants who throw stones should be shot, and told Americans that the Democrats would turn the country into a crime-and-drugs black hole. "They want to impose socialism on our country. And they want to erase America’s borders," Trump told a raucous rally in Chattanooga, Tennessee late Sunday. That worked for Trump in his own shock 2016 election victory. But the angry tone has turned off swaths of Americans, giving Democrats confidence that they could capture at least the lower house of Congress, even if the Republicans are forecast to hold on to the Senate. The Democrats rolled out their biggest gun in the final days of the campaign: former president Barack Obama, who on Sunday made a last-ditch appeal for an endangered Senate Democrat in Indiana. Laying into the tangled legal scandals enveloping the Trump administration -- especially the possible collusion between his presidential campaign and Russian operatives -- Obama scoffed: "They’ve racked up enough indictments to fill a football team." And describing the election as even more consequential than his own historic 2008 victory as the first non-white president, Obama said more than politics is at stake. "The character of our country’s on the ballot," he said. The party of a first-term president tends to lose congressional seats in his first midterm. But a healthy economy favours the incumbent, so Trump may yet defy the historical pattern. Although polls generally agree on Democrats winning the House and Republicans retaining the Senate, the margins are fine and a few key races will determine whether a real upset is on the cards. One of those is Democrat Beto O’Rourke’s challenge to Senator Ted Cruz in traditionally deep-Republican Texas. On Monday O’Rourke depicted the contest as an epic event, saying that Texans "will decide the election of our lifetimes. They will define the future, not just of Texas, but of this country, not just this generation but every generation that follows." Other races to watch include Republican Pete Stauber’s bid to flip a House Democratic stronghold in Minnesota, while Democrats in Florida and Georgia are aiming to become the states’ first African American governors. In the end, though, polls mean nothing if people don’t actually vote, so even stormy weather forecast for Tuesday in much of the east of the country could end up having an impact.